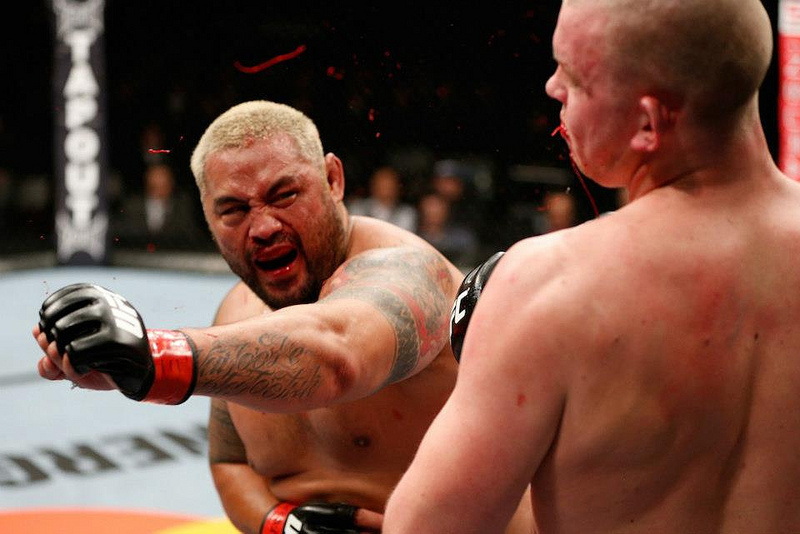 Despite being over 40 cm (over 1 foot) shorter than opponent Stefan Struve, Tiger Muay Thai & MMA Training Camp Phuket, Thailand alumnus Mark Hunt walked away with a knockout victory at the UFC on FUEL TV 8 event on Sunday March 3 in Japan. Hunt (9-7) knocked out Struve in the third round with a big right and left combination. Hunt initially walked away after the last punch landed even though the referee had not yet stopped the fight. Struve was unable to get back up and Hunt was declared the victor. The big kiwi kickboxer improved his MMA record to 9-7 and is now 4-1 in the UFC. Hunt is a PRIDE veteran and won the K-1 World Grand Prix at heavyweight in 2001. With wins over Wanderlei Silva, Mirko Filipovic, and Ben Rothwell, Hunt is a formidable force with his hands. Hunt was last at TMT in 2011 before his bout with Rothwell at UFC 135. He won that fight via unanimous decision.